What do you get when you combine unforget table hooks and atomic energy? You get a sound that is fresh, unique and totally Shilts. 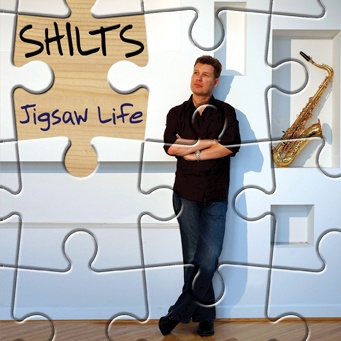 The former frontman for the funk-fortified Down to the Bone and groove jazz specialist, Shilts has signed with nuGroove for the release of his new CD, Jigsaw Life. �nuGroove was the original home for Down to the Bone. I�m excited to have Shilts back with us. When I heard cuts from this release, I was ecstatic. The songs are unbelievable. There was so much good material on this release that we had a hard time picking the first single,� said David Chackler, President and Co-owner. Paul �Shilts� Weimar originally hails from London, England and has been playing saxophone since his early teens. His career has spanned all forms of jazz, soul, rock and pop music. He has toured all over the world and performed with a host of international artists, such as The Brand New Heavies, Jamiroquai, Rick Braun, Jeff Lorber, Peter White and many more. Eventually Shilts became the most visible and identifiable member of the UK jazz group Down To the Bone. In his eleven years with the group, he remained excited creating a separate identity for himself. He did this with his highly anticipated debut, See What Happens, which earned a 2001 Smooth Jazz Award nomination, followed by his second and highly acclaimed follow up, HeadBoppin. His third and latest release, Jigsaw Life, is a powerful showcase of Shilts' multitude of performing and composing talents, focusing not only on his tenor brilliance but also his instantly infectious melodies. �I�ve been lucky that I�ve played in so many different styles of music�soul, fusion, pop, big band, smooth jazz. I�ve brought all those different styles in this CD. I�ve tried to make each track sound different. The jigsaw to me is different styles of music,� said Shilts.